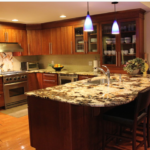 Welcome to our gallery featuring Cambria Devon quartz kitchen countertops design ideas. Devon is a very dark grey almost solid black custom color from Cambria USA. It is tranquil, neutral and simple. 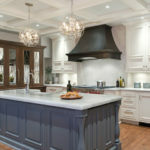 Devon is no doubt the new black&grey mix for contemporary kitchen remodeling projects. 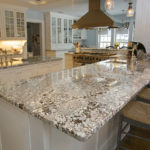 Furthermore, Cambria quartz brand has a many beautiful of quartz kitchen countertop colors. They are also available for bathroom vanities. According to designers of the main design ideas which is to make the contrast if you can. It is all about combinations of the colors. 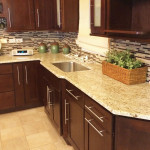 If it is dark flooring with light or white countertop which can combine with Cambria Devon. On the other hand, little lighter backsplash with white base and wall cabinets could be fantastic. 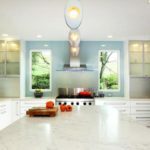 This is a very basic rule and try to combine the color that you like for your dream kitchen. 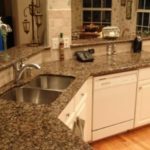 In addition, granite ever never comes as a solid color versus Cambria quartz engineered stone colors for sure. Like everything else in the life people do like different things when ever they are purchasing something. The bottom line is just a preferences. Besides, some people conservative some people modern and Cambria Devon is definitely for modern people. 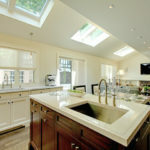 Cambria Devon quartz with beautiful white oak limestone backsplash and shaker white cabinets in this small L shape kitchen. 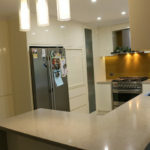 Quartz counter adds contrast to create a more contemporary feel maintaining original look. This combination works very well with laminated oak color flooring and stainless steel appliances. 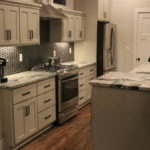 Besides, recess lights and off white paint walls added nice looking to the kitchen design. Flooring tile is porcelain, and the style is modern and the color is grey which contrast along with white cabinets. Moreover, stainless steel custom design hood and red subway backsplash tiles give a different look. 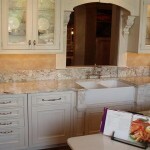 One of the Devon Cambria ideas is using with natural color and making only one part flashy. 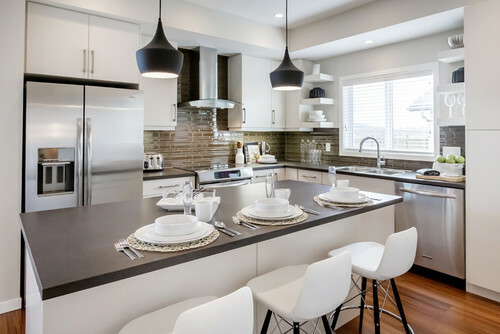 Modern cabinetry along with grey color Cambria Devon, bright lighting, glass tile backsplash and stainless steel appliances dominates contemporary style. 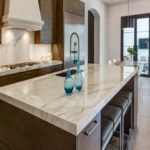 In order to have contemporary quartz kitchen countertops design,you can use with brown natural stone wall tile mixed with white natural stone. 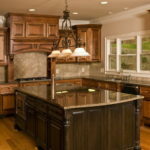 The wood used is also oak and it’s the same for the floor and cabinets which becomes extraordinary look to the kitchen. 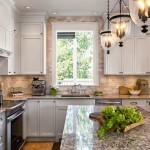 This kitchen has the combo of quartz and granite countertops. 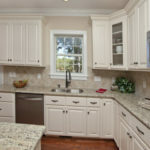 Kitchen side is Cambria Devon, the other side to use with granite combination. 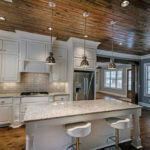 This look is amazing when you match with shaker white color cabinets and oak color wood flooring. 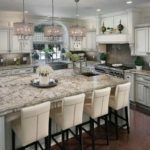 This kitchen is also inspired with stainless steel appliances, pendant lightings over the island and brick style grey color backsplash. 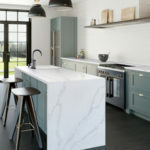 Beautiful Cambria Devon quartz with a Carrara marble subway tile look amazing. 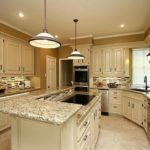 In addition, the kitchen inspired with dark wood flooring, white cabinet, recess lights and custom made stainless steel hood. 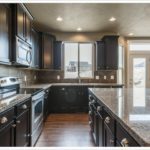 The combination of cabinets, backsplash and countertops are almost perfect. 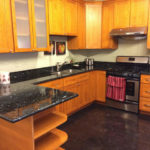 If you look at it to the picture backsplash has combination of both countertops and cabinets. So, it worked out perfectly as well as stainless steel slide in stove. Since, using the very dark espresso color floor tiles gave the room elegant captivating environment. 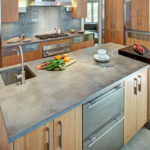 Finally, Cambria’s Devon countertop adds grey tones to the neutral color palette. 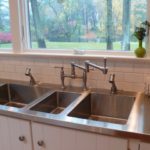 This three dimension new design subway style backsplash is very popular for contemporary look in today’s kitchen remodeling project. My goal on this blog is to provide you with a little more information about the decision you are about to make. 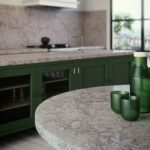 On the other hand, try to give design, inspiration, experience with a beautiful photos and maybe taste of what might goes with what in the kitchen designing world.